Stanley Marvel may be the clumsiest clot in Megaville, but he's happy to read his comics and dream his life away. That is until it's turned upside-down when he discovers that local hero, The Candy King, is actually a Super-Villain determined to conquer the world with his corrupt confectionery! As the sugary charlatan and his mad minions enslave the citizens with hypnotic gobstoppers and a giant remote control, Stan knows Megaville is in need of a Superhero. But when his crazy Gran and her crumbly chums reveal an earth-shattering secret, Stan's shocked to discover his own true identity! With a dose of secret formula and a pair of fantastic elastic anti-gravity underpants, Stanley Marvel takes to the skies as the greatest Superhero the world has ever known. Is it a bird, is it a plane? No, it's Superstan - a caped crusader fighting for truth, freedom and justice with his super powers, super tights and the strength to open a really tricky jar of pickles! Can Superstan crush The Candy King and save the planet? Find out in this funtastic adventure as our hapless Superhero flies by the seat of his pants, faster than a speeding paper aeroplane, and learns that with great power comes great hilarity! 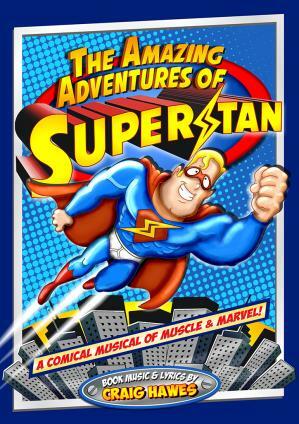 This marvellous musical packs a powerful punch with its witty script, crazy characters and spectacular songs, giving your cast and audience an unforgettable show that's quite simply... SUPER!